Almost 4.4 million Americans are chronically affected with hepatitis and surprisingly enough, most of them have no clue they have it. It's no secret that many ladies and gents enjoy a mani-pedi indulgence day. In addition to the hour or two of bliss and luxury, a trip to the nail studio is also believed to be a great stress reliever (and we can all use a little bit of that!). 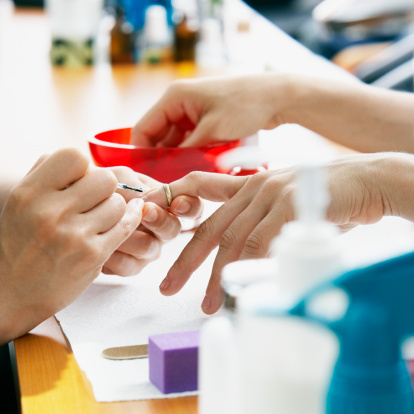 We don't want to rain on the well-deserved pamper parade, but choosing the right salon is absolutely essential, because a recent study has proven that there is a correlation between manicures and a heightened risk for contracting hepatitis. No!! Sadly, this is true. Let's take a look. The hepatitis virus is contracted by coming into contact with infected blood. Typically, this happens via intravenous injection of illicit drugs or via a blood transfusion prior to the adherence of stricter blood donation regulations. In some cases though, the blood contact isn't as dramatic. The reusing and thus sharing of instruments such as: nail files, nail brushes, finger bowls, foot basins, buffers, razors, clippers, and scissors - all used in nail salons and barbershops, increase the risk of coming into contact with another's blood. Often, people have no idea that they've contracted the hepatitis virus because either they have no symptoms or because the symptoms are so mild that they go unnoticed. Without proper treatment, some forms of hepatitis (most notably hepatitis C), can cause irreversible liver scarring that prevents the liver from performing its vital functions. In addition to the risk for contracting the hepatitis virus through blood, manicures and pedicures might also put the body at risk for developing hepatitis via toxins. Some of the solvents and polishes used in salons contain harsh chemicals, which are absorbed through the skin. The liver processes all toxins that enter the blood stream.. even those that are not ingested. Nevertheless, there are a couple of ways in which you can protect yourself at the nail salon. First of all, make sure that your salon’s license is clearly posted. Secondly, all instruments should be sterilized before each use. The same applies for foot basins and the suction screens in tubs, which is where deadly bacteria gets trapped. Moreover, always watch out for unmarked containers, if there is no label, then it is most probably diluted. It also wouldn't hurt to take your own nail polish to the shop. Bear in mind that nail salons and barbershops aren't the only places to hone in on hygienics: tattoo or body piercing shops, waxing studios, dental care offices, and any place that could expose your skin to that of another's. Getting a manicure and/ or pedicure can make for an amazing afternoon; just be heedful that all of the instruments used are clean, sterile and safe.